Renowned orthopaedic surgeon, Roland P. Jakob, MD will be inducted into the American Orthopaedic Society for Sports Medicine’s (AOSSM) Hall of Fame on Friday, July 6, during the Society’s Annual Meeting in San Diego, CA. AOSSM Hall of Famers are individuals who have made a substantial contribution to the sports medicine field. Renowned orthopaedic surgeon, Roland P. Jakob, MD will be inducted into the American Orthopaedic Society for Sports Medicine’s (AOSSM) Hall of Fame on Friday, July 6, during the Society’s Annual Meeting in San Diego, CA. AOSSM Hall of Famers are individuals who have made a substantial contribution to the sports medicine field. It is one of the Society’s highest honors. A native of Emmental, Switzerland, Dr. Jakob was educated at Burgdorf College and entered medical school in Berne in 1961 and Vienna in 1964. 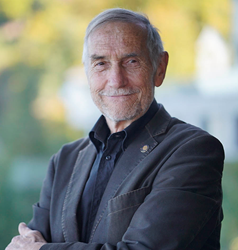 He started his training in general surgery at Inselspital Berne in 1968. Following his training, he left for a mission of the International Red Cross during the Yemen War in 1970. He started his orthopaedic-traumatological training in the same year, and then in 1972 went to Finland to study rheumatoid surgery. In 1973, he traveled to Toronto, Canada and began work in pediatric orthopaedics in shoulder, spine and knee. After starting shoulder and knee arthroscopy at the University of Berne in the mid-70s, Dr. Jakob was put in charge of knee and pediatric surgery. In 1995, after 20 years as Professor and Vice Chief at the Orthopaedic Clinic of the University of Berne, he went to Kantonsspital Fribourg, and trained numerous additional fellows. He has been Professor Emeritus since 2007. Dr. Jakob has lectured nationally and internationally on topics of trauma, knee and sports medicine and published extensively. He was a member of 10 scientific societies and served as President of three national and two international societies, five made him an honorary member. For the past 15 years, he has run a Swiss educational program in Eritrea, East Africa for Eritrean orthopaedic surgeons and traumatologists. He is continually teaching both locally and internationally and persues research on his favorite topics of cartilage repair, ligament and meniscus reconstruction, osteotomy, regenerative medicine and joint preservation.